Gingerbread houses built around milk cartons are a favourite activity in elementary school. If you want to make a house that doesn’t require pre-baking the parts, this is project isn’t intimidating. My four year olds made gingerbread houses at their Strong Startprogramme today. Other than the help they got to put the walls on their house, they took complete control of their projects. The house shown above was done by my son. Normally he’s pretty decisive about creative projects. He’s on task and finished in the most efficient way possible. With this project he spent about an hour pasting on pieces and creating his first gingerbread house. Both of my children were thrilled with the result and, surprisingly, they’re showing restraint and are not picking their houses apart… yet. – You will need 6 for one house. If you want to do extra features such as make window shutters or an open door, you will need more. – The icing should resemble the consistency of thick, runny glue. You want it to be thin enough to manipulate but thick enough to hold items together. A small spoon for applying the icing. Cup to hold a small amount of icing. – Rather than working from the larger bowl. Small cardboard covered in foil. – This will be a base for the house. – To staple the open mouth of the carton closed. – Smarties, rockets, miniature red and green baking chips, raisins and other small, light weight candies you might find in the bulk section of your grocery store. – Chocolate or marshmallow figures; marshmallows, for a chimney or snowman; licorice; candle cane balls; teddy bear graham cracker cookies and candy canes. You can also add a small gingerbread cookie to add to the side of the house, as shown above. Optional: Piping bag for an older child or adult. – If you don’t have one you can cut a corner, diagonally, on a ziploc bag. Wash out and dry the carton the day before. Staple the mouth closed. Add a pool of icing in the middle of the foil covered cardboard. This is where you will build your house. Place your carton in the middle of the icing. Spread a liberal amount of icing on one graham cracker and stick it to one of the four sides of the carton. Do the same with the other three sides. Let these sides set on the sides of the milk carton before adding two graham crackers on the roof. (One on either side.) The crackers should rest flush against the top of the crackers standing vertically on the sides. If the top cracker slides over the side wall, it could eventually slide off. Once the siding on the house has set well, add decorations making sure that a good amount of icing is under each candy. Older children could pipe extra icing to cover up the carton that is peaking through underneath the graham crackers. How elaborate the house will be depends on the skill level (age) of the child and imagination. The example shown at the top of this post was completed by a young four year old with minimal adult assistance. Whenever you see preschool aged children and parents come together, you will often see parents’ hands on the child’s work doing at least half of the task. When the opportunity arises children will say that they can do their proejcts by themselves. (Truthfully they might need a bit of assistance but overall they are right.) The scale of this project is perfect for the child who really wants to make a gingerbread house without a lot of help. 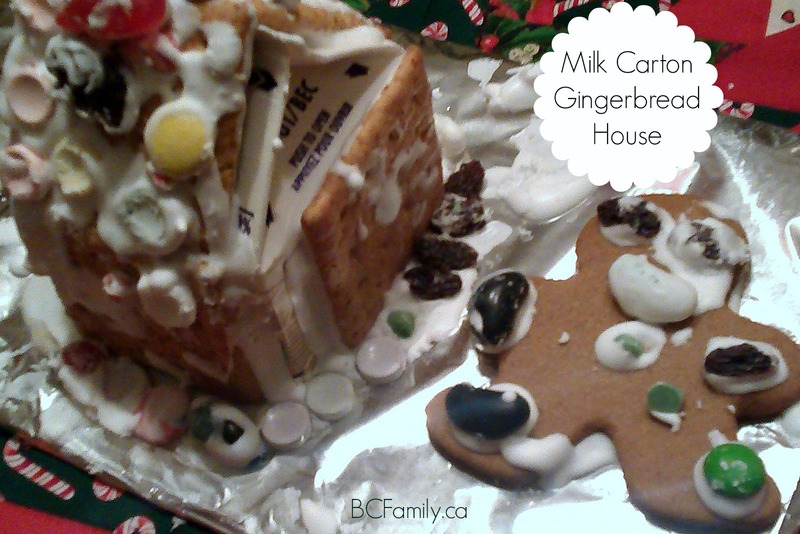 Have you tried making a gingerbread house using a milk carton? You can comment about this posting using the comment function below or on the BCFamily.ca Facebook page. Your contribution matters so don’t be shy! Fantastic! Here’s the perfect easy craft for me and my kid. Thaks for sharing! What a great idea! I never would have thought of using a milk carton but it makes sense, it can be so frustrating getting a gingerbread house to stand up… especially for little kids. Thanks for the tip! You’re welcome, Brooke. It’s a fun project and it doesn’t require baking. Bonus! Hi, Brianna, A mum at our Strong Start suggested that we could have made the houses with regular crackers that have perforated lines – easy to break. Are there gluten free crackers that are square and large enough that you could use them? You’re welcome. I agree that it works particularly well for little ones who like to work independently. 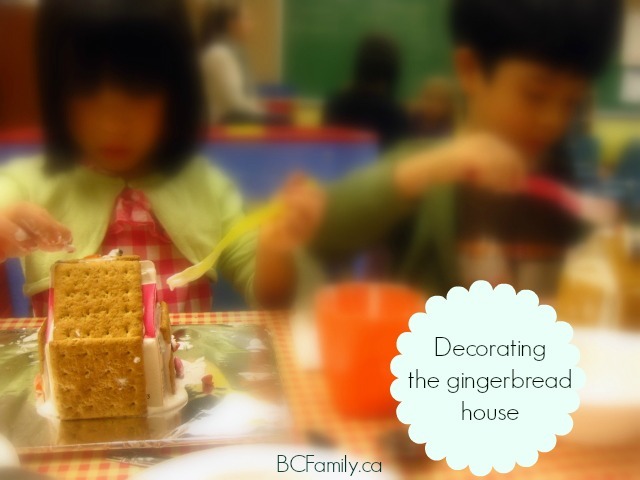 We were thinking about making a gingerbread house and this way is a great idea! Thanks for posting it. I hope everything will go well for you, Salma, if you decide to make a house. These are small enough that you could even make a few and put them together.